Vandals have burned down the Queen's secluded beach chalet in Norfolk. 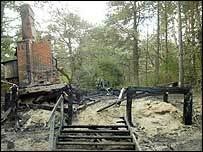 A charred frame is all that is left of the wooden hut which stood in woodland at Holkham on the north Norfolk coast, one of the county's most popular beaches. An arsonist set fire to the building on Sunday night. It was used by the Queen Mother and other members of the Royal Family during their regular stays at the Queen's nearby Norfolk estate at Sandringham. Seven firefighting crews from Holt, Wells, Dereham and Fakenham joined a crew from Sandringham to deal with the fire which spread to the surrounding pine forest and gorse. Firefighters were forced to reach the site on foot to douse the flames which destroyed the building within a hour of the first 999 call. A Buckingham Palace spokesman refused to give details of how often the Royal Family used the beach chalet. A spokesman for the Sandringham Estate said on Tuesday: "It was basically a private picnic hut used by the Royal Family. It was kept very private." It was given to the Royal Family by the fifth Earl of Leicester, who died in 1976. 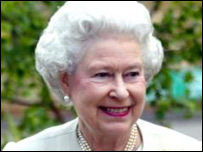 The Earl's daughter Anne, Lady Glenconner, who lives in Burnham Thorpe, said the Queen enjoyed visiting the chalet. It was especially popular with the Queen Mother during her summer visits to Sandringham. The royal corgis were a familiar sight on Holkham Beach, a location for filming of the award-winning Shakespeare in Love. Norfolk Fires Service's western area commander, said it appeared the fire had been started deliberately. A spokesman for Norfolk Police said: "We are investigating a fire that totally destroyed a beach hut at Holkham. "The hut belongs to the Royal Estate at Sandringham. The matter is being treated as suspicious."